In Capcom‘s seminal 1985 arcade run-and-gun title Commando you are cast in the role of Super Joe, hero of the arcade legend’s earlier Bionic Commando coin-op. Dropped behind enemy lines by helicopter (unfortunately absent from the Spectrum conversion – perhaps due to defense budget cuts) you find yourself undertaking that 1980’s favourite mission of ‘one man against an army’, aiming to breach a pair of super-fortresses located at the end of two sets of four vertically-scrolling action-filled desert levels. Your frankly suicidal commando is equipped with everybody’s favourite weapon, the unlimited-ammunition machine gun, along with a stock of grenades which must be replenished from handily placed supplies throughout the levels. By default grenades are dispatched by holding down the fire button for a moment as, unlike the arcade parent, Spectrum-era joysticks were restricted to a single logical fire button, even for multi-triggered Quickshot sticks. You know you’re in for a treat from the moment the impressive loading screen is displayed, featuring a mix of in-game graphics and traditional artwork to whet your appetite. The graphical splendour continues to the game proper with finely detailed player, enemy and vehicle sprites alongside a liberal smattering of equally well rendered bunkers, bridges, rivers and fox-holes. Unfortunately as with so many Spectrum games there is no in-game tune*, with sound restricted solely to functional but effective spot effects, however the all-important, all-action gameplay has been faithfully translated. The home version boasts incredibly frantic, fast paced, heart pounding action. From the off panic soon begins to set in as the screen becomes literally filled with enemy solders unleashing a fusillade of mortar shells, machine gun rounds and grenades. The rush of storming each end-of-level sub fortress, and the seemingly impregnable super-fortresses thrills as effectively in the home as it did in the arcade. 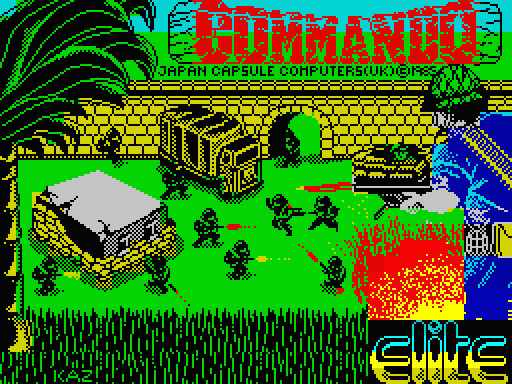 Commando is certainly as tough after thirty years as it ever was, yet never unfairly or frustratingly so, neatly balancing the difficulty level and maximising that elusive ‘one more go’ replay factor. Fighting seemingly impossible odds, in much the same manner as the eponymous commando himself, with this gaming gem Elite produced arguably the most impressive of the all the 8-bit micro conversions of this all-time classic. * A hacked 128K version of the game now exists which includes a great AY chip-tune playing throughout. Video of the modified version can be viewed below. This information comes courtesy of a member of the Spectrum 4Ever group on Facebook. Great review. I suffered from the Acorn Electron version in my youth. The Spectrum version is far superior.